Wrightias are very tropical plants and love the heat. During the winter here in S. Florida they loose all their leaves. During the spring as the weather warms up the plants sprout and begin to flower right after. They prefer full to partial sun. Even a little bit of filtered light is OK. When they are growing keep the soil moist and fertilize well. During the winter dormancy keep the soil slightly moist and don't fertilize. 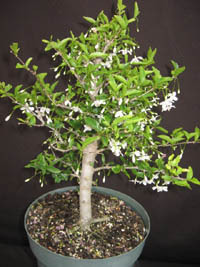 It kept indoors during the winter, and under warm conditions the plant may not go fully dormant. 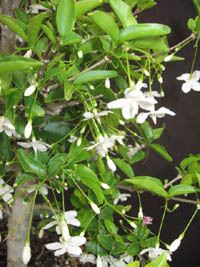 Wrightias bloom for a long time beginning in the spring and are fragrant. Avoid freezing temperatures.